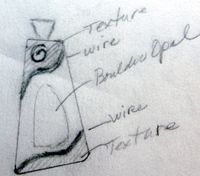 LaJeanne Design Jewelry: How It Begins. . . .
How It Begins. . . . I thought I would put up here, just a bit, on how my pieces get started. I actually don't spend too much time thinking about it. It starts when I get my stone and put it on a pieces of paper in front of me. Sometimes, the paper is just a little yellow post-it. But usually it's in my spiral sketch pad. 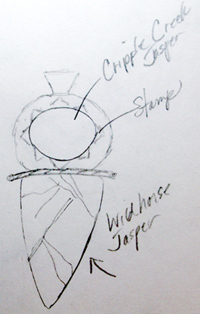 I start by tracing the stone on the paper, then do several configurations around it till I get one I like. It's not rocket science for me. Maybe, I should plan a little bit more, but I get an idea I am happy with and go from there. 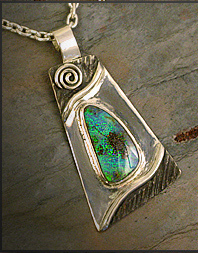 Here are some photos of two of my recent sketches, and then the final piece of jewelry. 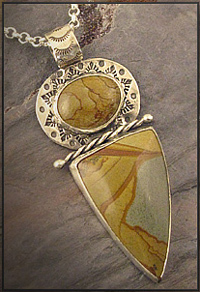 How did you know the pattern of jasper before you set it?